STS-Global can include freight to any destination in the world! Whether it is land, sea, air or by courier, we can always offer you the safe transport of your goods and the necessary insurance to the final destination according to Incoterms standards. You will often find us to be the most reliable way to transport your goods to the final destination, undamaged and on schedule. STS-Global will ensure that your goods are packed and shipped according to necessary requirements, and we will find the most suitable means and price for your needs. Ask for the freight price when you are making your inquiry. To keep up with the fast-paced needs of our diverse clients, such as commercial companies and relief organizations, many vehicles, equipment and also most parts are available from stock and can be delivered to a forwarder or your destination quickly and easily. 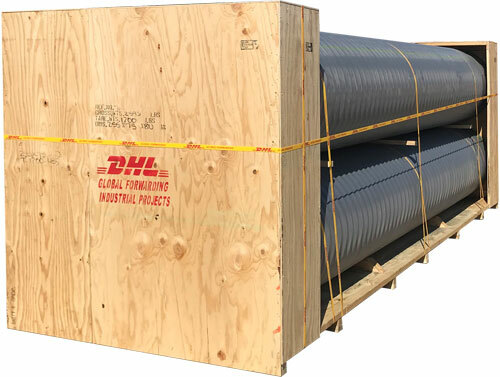 STS-Global already have a daily supply chain of spare parts (pipeline system) for some clients, and we would be happy to set up a similar system for your organization. Our mistake rate in delivering spare parts is less than 0.01%, and our ISO 9001 management system is set up to catch mistakes before they happened. We use heat-treated wooden boxes to avoid handling and transport damage during the long transport. And the boxes are also assembled using special screws to minimize the chance of anything going missing due to theft. STS-Global can arrange for a pre-inspection of the goods if required, and we have many years’ experience in supplying parts and vehicles to countries with complicated import restrictions. Have more questions about delivery?